Cebu Basketball’s biggest fiercely competitive collegiate basketball league - CESAFI-2016 season kicks off with a colorful opening ceremony and a main game between defending champions University of San Jose Recoletos and tough and talented former champions University of Cebu which begins on Saturday at the historic Cebu Coliseum. The games will be telecast over Aksyon TV nationwide as well as on Cignal, tentatively on a Monday thru Friday schedule from 12:noon to 2:00 p.m.
As Viva Sports TV analyst Rico Navarro notes "every time August rolls around, Cebu basketball fans are up and excited for Cebu’s most established tournament that traces its roots all the way back to the past 50 years (or more). It remains to be the only long-running basketball show in town, a testament to its rich history and tradition. CESAFI's most popular product is back-to-back PBA MVP June Mar Fajardo of San Miguel who played for the University of Cebu during his college days, who, in Sunday'sm game against sister team Purefoods Hotshots was easily the "Best Player" of the game. Also in the star-studded PBA which has continued to draw large crowds are the likes of PBA rookie of the year Greg Slaughter of the University of Visayas and Alaska's remarkable shooting star, the ageless Dondon Hontiveros of the University of Cebu. There were several more PBA superstars who emerged from Cebu such as four-time PBA MVP Ramon "El Presidente" Fernandez of University of Cebu, two-time PBA MVP Abet Guidaben (USJR), the late Arnie Tuadles (UV), Bernie Fabiosa, Jojo Lastimosa (USJR), Dondon Ampalayo (USJR), Al Solis (UV), and Boy Cabahug (UV) among others. As CESAFI gets the wider exposure it richly deserves through the tie-up with Viva Sports and Akyson TV under the umbrella sponsorship of SMART, the country kicks off another season that would hopefully produce the future stars of Philippine basketball. 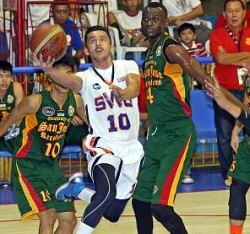 It’s game time for CESAFI 2016 on a new and widely-watched TV network with a major sponsor in SMART, long associated with Philippine basketball.